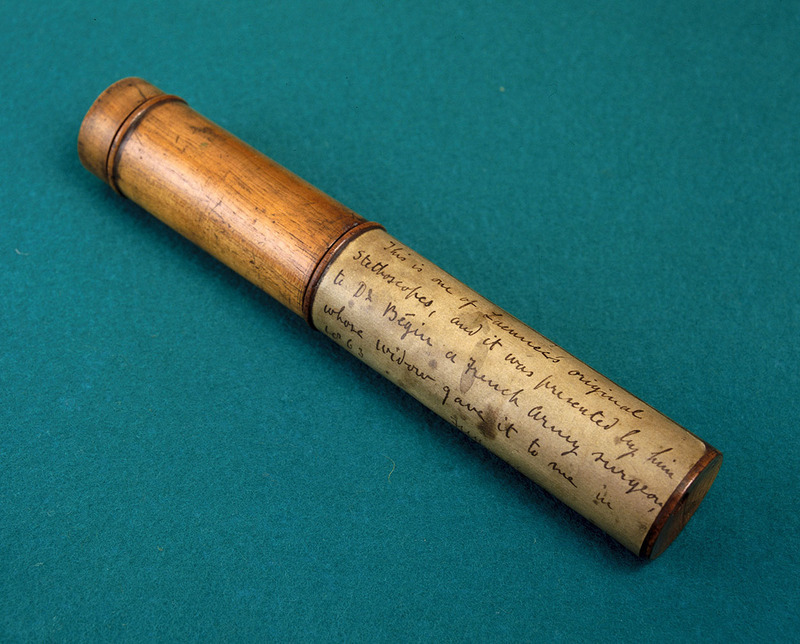 This week, Rebecca takes a look at the Royal Victoria Dispensary case notes, exploring the wealth of information collected from each patient before they were clinically examined. 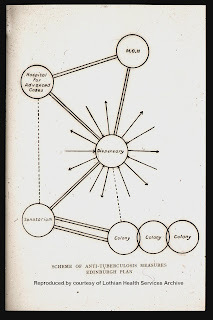 Diagram of the Edinburgh Scheme, showing the central role of the dispensary. I’m currently working on a series of case notes from the Royal Victoria Dispensary, the outpatient clinic which acted as the first point of contact for people suspected of having tuberculosis in Edinburgh. The dispensary, based on Spittal Street with an additional clinic in Leith, saw thousands of people each year. Being referred to the dispensary was not a sign that someone had tuberculosis, rather it was a way for likely cases to be examined and a diagnosis of tuberculosis eliminated. 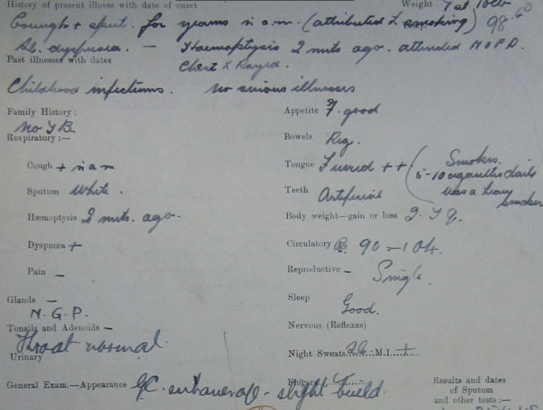 Patients would be referred for a number of reasons: they may have lived with or been related to a notified case of tuberculosis; their GP or School Medical Officer may have referred them based on their symptoms; they may have been sent for a ‘large film’, a more detailed X-ray to check on any abnormalities detected during mass radiography; or they might require examination before entering certain professions. For example, all apprentices in the printing trade would be screened, as it was an industry with a high mortality rate from tuberculosis, attributed to crowded working conditions. Others requested to go in for an ‘overhaul’, usually due to nervousness that they had the condition. When they arrived, the patient would be quizzed on a variety of factors which would give a general background to their health and lifestyle. But what exactly was it that was being looked for? Firstly, a patient would be questioned on the presence of key symptoms including coughs and sputum, dyspnoea (breathlessness), and haemoptysis (coughing up blood). Temperature, pulse, and weight gain or loss would also be recorded - not for nothing was TB also known as ‘consumption’, as dramatic weight loss would often accompany the condition. Other symptoms such as night sweats or the presence of finger clubbing, associated with severe pulmonary tuberculosis, would also be recorded. Pulmonary tuberculosis can often be present without visible symptoms, so factors such as the size of the patients’ family and any family history of tuberculosis were also recorded. Tuberculosis spreads following prolonged close proximity to sufferers, so a close relationship with a sufferer was worth investigating. The patient’s occupation would also be noted, in order to ascertain if they worked in a dusty occupation or a physically taxing position. 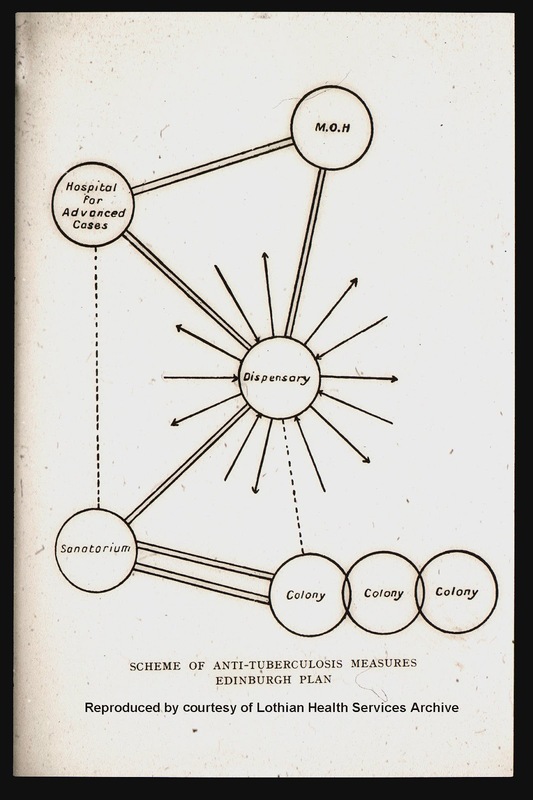 This information was also a valuable indicator of poverty and poor living conditions, which were associated with tuberculosis and which a doctor would have borne in mind when recommending treatments. note that this is not pre-printed on the form. From the 1940s onwards, case notes also note how many cigarettes a patient smoked per day, which is interesting considering the relationship between smoking and lung cancer was first proposed, and not immediately accepted, around 1950. Smokers who were found to have some lung symptoms were usually told to stop or curtail their smoking, which goes against the impression that many people now have of the popular and clinical attitudes towards tobacco consumption at the time. A final note on the patient’s general condition (‘subaverage’, ‘satisfactory’, etc.) would also be made. A few case notes refer to ‘long eyelashes’, referring to an earlier idea of two forms of tuberculous patient; the beautiful, delicate consumptive, with long eyelashes and fair complexion, and the other with “coarse, thick features” and a sallow complexion. If a patient was perceived to live in poor conditions, to be malnourished, or to have an unsatisfactory personality, this would often be recorded as well. Note on a patient's general condition: "GC Fair only. but not bad for age"
All of this information would be recorded before a patient even got so far as a clinical examination or an X-ray, and it is not clear from the case notes if this part of the examination was carried out by a doctor or not. But it was important for all of this to be recorded, and it is obvious from the case notes that this information was a useful aide in determining if a patient was suffering from pulmonary tuberculosis. As well as this, these case notes also provide a fascinating insight into the work and habits of tens of thousands of Edinburgh residents in the post-war period. Macfarlane JT, Ibrahim M, Tor-Agbidye S., ‘The importance of finger clubbing in pulmonary tuberculosis.’, Tubercle, 60 (1), (Mar 1979), pp. 45-48. An example of obsolete treatment in the Norman Dott Case Notes (1920-1960): lobotomy. The Norman Dott case notes are an invaluable source for the history of neurosurgery. They contain many examples of pioneering medical techniques, but also of treatments and diagnoses which are now obsolete. One of the most striking examples is the psychosurgical procedure on the frontal lobe better known under the name ‘lobotomy’. Nowadays, this word evokes a botched, barbaric practice that trampled the rights of patients and stripped them of their individual and humane qualities. However in the 40s and 50s, this operation was regarded as a way to relieve some patients of their sufferings when all the other treatments had failed. In Britain, where the term ‘leucotomy’ was used rather than the American word ‘lobotomy’, the first operations were carried out at the Burden Neurological Institute in Bristol in 1940, at the instigation of Frederick Golla, Effie Hutton and F. Wilfred Willway. The use of the procedure peaked in the late 1940s and early 1950s, with nearly 1500 operations a year. However, the poor results of the operation, the harmful consequences observed in patients, and the progressive introduction of psychiatric drugs led to a sharp decline of the practice by the end of the 1950s. The vast majority of the case notes I have been working on as the cataloguing archivist of the Norman Dott project date from this period; and indeed, out of the 2500 case notes I have catalogued so far, less than twenty mention a leucotomy. However, these cases greatly help to understand in what context it was used and on what kind of patient, and for which results. The vast majority of patients who underwent a leucotomy in the Norman Dott case notes at the end of the 1950s were women, aged from 24 to 73 years old. They were usually suffering from various mental illnesses described in the case notes as: ‘hebephrenic schizophrenia’, ‘catatonic schizophrenia’, ‘chronic depression’, ‘agitated depression’; or more precisely: ‘long-standing and deep seated neurotic illness in an inadequate personality’, ‘recurrent depression with maniac depressive personality’. Doctors were well aware that leucotomies were not a ‘miracle solution’, far from it. They knew that recovery was not guaranteed and that it could change the patient’s personality and make them less socially apt; however the alternative was judged worse and the goal was to dull the symptoms of psychiatric illness to enable the patient to lead a more peaceful life or at least to make him or her easier to nurse. This sentiment is expressed by two doctors considering a leucotomy at the Royal Infirmary for their patients: ‘I think that leucotomy would relieve his suffering and might make it possible for him to make some sort of adjustment outside hospital’; ‘[I feel] that a leucotomy would allow of a modified social recovery enabling [the patient] to lead a fairly normal life though leaving her rather ineffectual and needing guidance in her day to day activities’. Excerpt from a case note relating to a female patient suffering from chronic depression, 1959. LHB1 CC24 PR2.20898. One must keep in mind that the procedure was only used as a last resort. The patient had to be in a deeply disturbed state which would make living in these conditions unbearable. Again quoting from Norman Dott case notes, it is said that one patient ‘was inaccessible and auditorily hallucinated. There was considerable volitional retardation and she was monosyllabic’. For another patient, ‘operation was especially commended because of intractable noisy perseveration; the word “money” occurring endlessly’. Moreover, leucotomies were only performed when all other treatments had failed: in the case note PR2.20920, it is said that ‘ECT has only produced temporary improvement and tranquillizers have not been effective’, in the case note PR2.20698, the doctors who examined the patient agreed that ‘he should have a leucotomy carried out in view of the prolonged period of unsuccessful conservative treatment’. At the time, other treatments included electroconvulsive therapy (ECT), tranquilizers, and modified insulin injections, also known as insulin coma therapy (ICT). The following extract from a case note describes a leucotomy performed in 1959 on a patient suffering from ‘agitated depression’ at Ward 20 of the Royal Infirmary of Edinburgh. Essentially, the surgeon would drill a pair of burr holes into the skull in order to insert a sharp instrument called a leucotome into the brain, that he would then sweep from side to side to separate the frontal lobes from the rest of the brain. 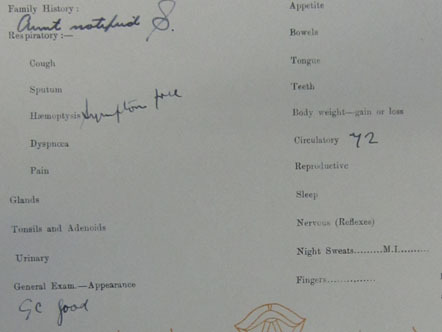 From what we can gather, the outcomes of the leucotomies carried out in the Norman Dott case notes were very mixed. Only one patient seemed to do better: ‘in the few days after the operation and prior to her return to Bangour, [the patient] certainly appeared more relaxed, approachable and less disinclined to talk’. 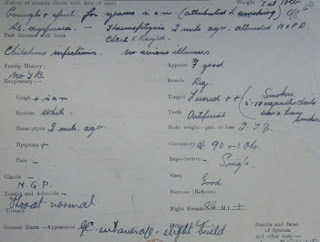 However most of the time the results were more disappointing: ‘little change was noted after operation’; ‘however, [in the following days], there was some suggestion of her being less accessible’; ‘in the first post-operative days [the patient] was confused and towards the end of the first week still disorientated in time; somnolent and incontinent of urine and faeces. He recognised his surroundings; knew that he had been operated on and why. There was no appreciable change in his mood’ and he ‘still appear[ed] to be grossly preoccupied and depressed’. Unfortunately, the case notes only mention the days immediately following the operation so we have no way of knowing how the situation evolved for these patients on the long term, but from other leucotomy cases, we know that it was not uncommon for patients to be crippled for life or to live in a vegetative state. The use of leucotomy has been criticized from the very beginning for the risks it posed for the patients and for its very limited and often unpredictable results, although it was performed in situations in which the doctors thought that the benefits would outweigh the risks. The cases we find in the Norman Dott collection, although few in number, enable us to understand the context of this operation, and what the reasoning behind its use was. The study of medical failures and outdated treatments is essential to understand the evolution of neurosurgery. History of psychosurgery in the United Kingdom [online]. Wikipedia. Available from: https://en.wikipedia.org/wiki/History_of_psychosurgery_in_the_United_Kingdom [Accessed 19/05/2016]. Levinson, H. (2011), The strange and curious history of lobotomy [online]. BBC News magazine. Available from: http://www.bbc.co.uk/news/magazine-15629160 [Accessed 19/05/2016].